Im Rahmen der Vorlesung «Verkehrsökonomie 2» wird eine Machbarkeitsstudie zur Elektrifizierung der Postauto-Strecke Urnäsch-Schwägalp durchgeführt. Die Idee ist es herauszufinden, ob man den Dieselbus mit einem Elektrobus ersetzen könnte und so eine Vorreiter-Rolle bezüglich nachhaltiger Mobilität in Bergregionen erlangen kann. Als Einführung zur Studie wurde am 1. März 2019 eine Exkursion ins Appenzellerland gewagt, um die Bedingungen an die Strecke vor Ort mit eigenen Augen zu sehen. The 98th annual transportation conference attracted more than 13000 experts from all over the world to gather in Washington DC between 13-17 January 2019. The meeting program covered all transportation modes, with more than 5000 presentations in nearly 800 sessions and workshops, addressing topics of interest to policy makers, administrators, practitioners, researchers, and representatives of government, industry, and academic institutions. A number of sessions and workshops focused on the spotlight theme for the 2019 meeting: Transportation for a Smart, Sustainable, and Equitable Future. Within this huge networking event, INE presented a poster of the Smart Commuting project. Insights into how a smart and sustainable commuting environemnt can be built has been given and attracted a lot of attention. 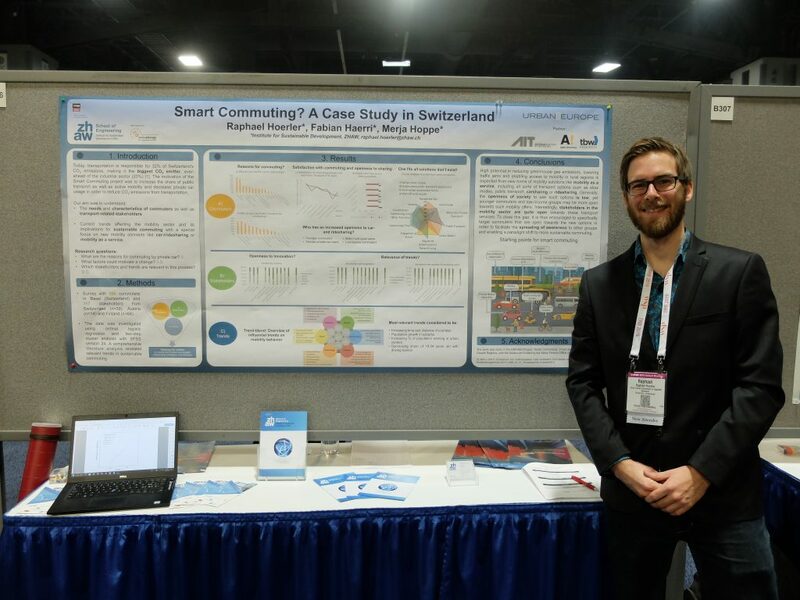 The poster was awarded with “Best in Session” poster award by the standing commitee on public transportation planning and development (more information about the project can be found here: https://smartcommuting.eu). As such, a main selling point was the visualization of four different commuter groups derived through a cluster analysis, enabling more strategic policy measures. Furthermore, we explained that the commuter society is still not open towards the use of sharing mobility options like car-/ridesharing or bikesharing. Here, it is encouraged to target younger commuters and female private car users as they show an above average openness and could thus spread the awareness to other groups. Interestingly, transport-related stakeholders seem to be willing to actively support shared mobility, displaying a gap between the openness of the commuter society in contrast to stakeholders. Lastly, influential trends were found to be the increasing population growth in suburbs and increasing working population in city centres. The trend of lower share of driving licences among young commuters however depicts a starting point for more sustainable ways of transportation. The TRB conference revealed that the focus of MobINE on shared mobility, autonomous driving and electric mobility is on spot and that mobility experts increasingly demand for a mix of qualitative and quantitative research instead of solely quantitative models. Im Rahmen einer Vertiefungsarbeit eines Masterstudenten der ZHAW führen wir eine Umfrage zum Thema „Freizeitmobilität in der Schweiz“ durch. Wir würden uns sehr freuen, wenn Sie durch Ihre Teilnahme diese Arbeit unterstützen könnten. Klicken Sie bitte auf den unten stehenden Link oder auf das Bild, um die Umfrage zu starten! Selbstverständlich ist Ihre Anonymität garantiert. Gerne können Sie den Link zur Umfrage an andere Personen weiterleiten.